Passenger on the top deck of a tourist bus passing through Waterloo. I’ve read a lot about the ‘instagramisation’ of photography. I think that means taking slightly dull images, applying filters and presets to them and presenting them as bits of creativity. At the right time and in the right place those kinds of pictures have value and can make significant additions to creative campaigns and can go a long way towards making some elements of social media and social marketing more visually interesting. 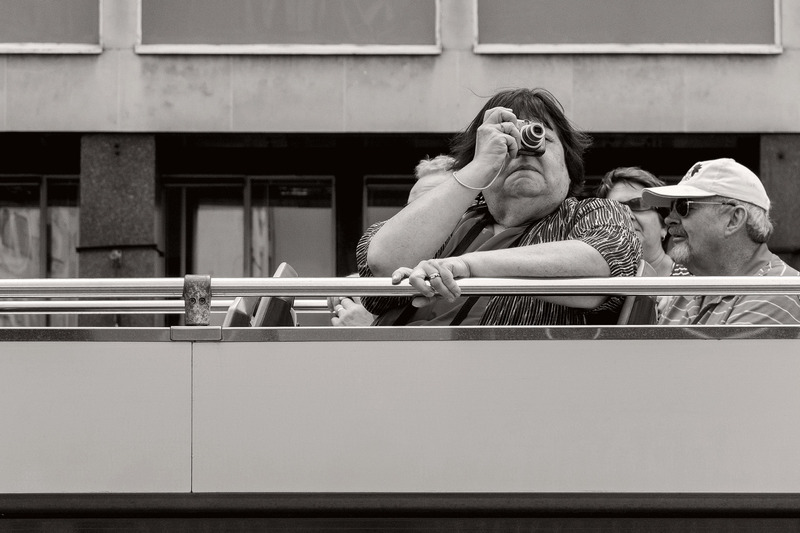 I’m not talking about that here – this blog post is all about choosing between making decisions about individual pictures or letting technology take over and ‘improve’ your work for you. I took delivery of my first Kodak DCS520 digital camera in late November 1998. It was a revelation. I had used a previous model (DCS3) which was pretty poor and I wasn’t really that convinced about the whole process. After three days, I was a convert – the kind of convert who then sees it as their role to evangelise about their new-found wisdom/insight/faith. Based on the Canon EOS1n camera, the Kodak conversion replaced the whole of the back of the camera and quite a big chunk of the electronics too. It was expensive, relatively slow and it only had 1.9 megapixels. It had a tiny low resolution LCD screen on the back and it used enormous and expensive batteries that rarely lasted a whole day but I absolutely loved it from that first week! This was one of the first proper portraits that I shot with my first DCS520 (known as the Canon D2000 in some countries) and it was of a double bassist and jazz teacher in his own home. My conversion was so dramatic and so complete that I even remember sulking a little when I had to shoot on film for the glossy sections of the newspaper. We worked with these early cameras for nearly four years until the Canon EOS1D came out. Nikon had introduced the D1 in that period and the see-saw battle for supremacy between the two big manufacturers with input from Kodak and Sony began in ernest. Talking with others who used the Kodak DCS series camera from that era we all agree about one thing – how good Kodak’s software was. What a shame that they threw away their lead in professional digital photography. If they had even kept their software development going, they could possibly have avoided needing to file for bankruptcy protection in the US courts last week. I look back at the early days of digital with a real fondness – they really were the most exciting of times. There’s something very cool and very rewarding about being in the second row of pioneers! Which came first… the Chicken or the egg, digital imaging or workflow? One of the rather brilliant side effects of teaching is that you had to look very long and hard at your own practice to make sure that it will stand up to the examination of younger and more eager minds. I have taught workflow on and off for a few years now and I have come to the conclusion that all photographers should get theirs checked every once in a while to make sure that they haven’t fallen into the bad habits trap. It doesn’t take much time and going through what you do and why you do it with an experienced teacher of these things is a great idea. I have also discovered how useful having a go at a proper edit of someone else’s pictures can be. Photographers are rarely their own best editors and it is a brilliant exercise to do an edit of a job where you give no attention to including pictures just because were hard to take or to pictures that you really like but don’t help tell the story. Captioning should also be part of that exercise because we all make assumptions when we do our IPTC that a disinterested party wouldn’t make. All in all, I thoroughly recommend these exercises to you. In a rather tongue-in-cheek reference to the Alcoholics Anonymous “Twelve Step Plan” to beat addiction, I developed the photographers 12 step plan to get a good, dependable and repeatable workflow. It doesn’t matter that you can cut twelve steps down to seven or eight if you need to work fast and it really doesn’t matter that step twelve was “relax and put your feet up” anyway. What actually matters is that you have a tried and tested way of getting your valuable pictures from the camera to the client and back them up without making silly mistakes that cost you time, image quality and (worst of all) money. For years I have been “quoting” the Hippocratic oath that Doctors and other medical folks take when they take up their calling. I have put “quoting” in inverted commas because it turns out that the phrase I have always used isn’t part of the oath at all – it’s just a line from a film! Anyway I’ve been saying this; “First, do no harm”. It works for medicine and it certainly works for photographer workflows because the idea is that you never damage the original file – always working on a copy. Of course, with Jpegs that have had anything more than very light compression applied that means that you have already sacrificed some quality – but I don’t want to go down the whole RAW Vs Jpeg road again. INGEST/IMPORT – get the images and any supporting files from the camera into the computer. Applications designed to ingest or import files look inside folders and sub-­folders on the memory card in a way that you might not be able to do by simply copying files from the card yourself. It’s important to note that this is one of the easier steps to cut out if you are in a real hurry. FIRST EDIT – make an initial selection of the images that you are interested in. At this stage you can dispense with very badly exposed frames, pictures where the focus has been missed, where important people have their eyes closed or pictures that are just not very good. COPY – move a copy of the selected images to a new folder. RENAME – give the selected pictures a new name. Some clients will have a formula that they want you to follow but otherwise try using a simple word identifier, followed by a six‐digit date and then a sequence number. All good software has the ability to batch rename and sequentially number files. A set of portraits of Tony Blair shot on the 3rd of April 2011 might be blair-­110403-­001 through to blair-­110403-­204. The exact formula that you pick isn’t as important as having one that works for you. The filenames that the camera assigns are not good enough and not unique enough for professional use. CAPTION – using the IPTC metadata fields to add information about what is in the picture, when and where it was taken and by whom it was taken. This is the best way to insure that your pictures can be found again – all image archiving and storage systems work with metadata. SECOND EDIT – narrowing the selection of images down to those that will make it into the final edit or the selection that will be delivered to the client. CONVERT – taking the RAW images from the final edit, making adjustment to colour, exposure, brightness, contrast etc using a RAW converter and then saving the toned images to the required file format. RETOUCH – opening the images into Adobe Photoshop or a similar application to remove dust spots, make subtle (but ethical) changes that cannot be made in the RAW converter, which, these days, are very few. SAVE – the final stage before sending to the client is to save the edit in the format that the client requires either JPEG or TIFF are most likely. DELIVER – most images these days are delivered using the internet. FTP is the most efficient but you may also be asked to email pictures, create web galleries, upload to third party viewing sites or simply burn everything to a disc and put them in the post. ARCHIVE – make sure that you back up copies of everything that you may need again. External hard drives, cloud storage systems and op?cal discs are the most common options. Multiple back ups are the best way to avoid losing your images due to the ageing of materials or the failure of drives. RELAX – that’s the end of the process!